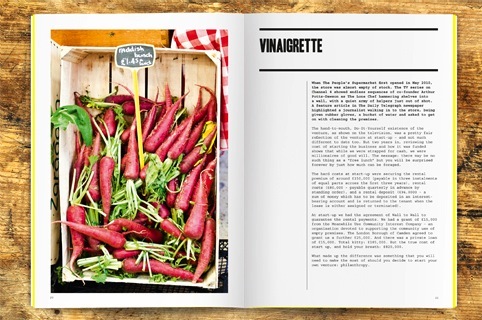 Unreal has designed two books for The People’s Supermarket, a co-operative supermarket which featured in a channel 4 documentary of the same name. The People’s Supermarket is a community-based shop managed and owned by members selling largely locally sourced, seasonal and sustainable produce. 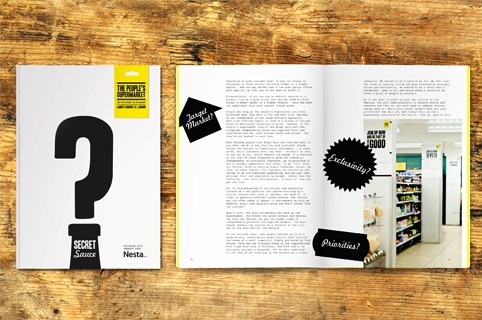 Unreal – which designed The People’s Supermarket identity in 2010 – was asked to create one book, Secret Sauce, which tells the story of the supermarket. A second, the Members Manual, details the membership process and what to expect when volunteering at the supermarket. ‘The design of both books stays true to the bold, vibrant brand and identity we created in 2010, with a strong use of iconography and typography,’ according to senior designer Ryan Tym. ‘The look aims to emphasise the communal, affordable and democratic values of the store without appearing too virtuous or elitist,’ says Tym.